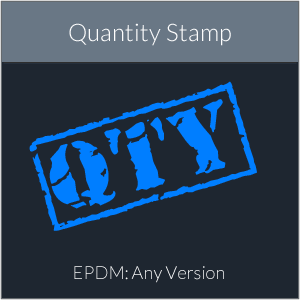 PDM Quantity Stamp – ehcanadian Consulting Inc. Stamp your PDFs with Part Quantities! This add-in is an addition to the standard EPDM Convert task add-in. It places a note on the PDF of SolidWorks drawing being converted with the total quantity of the part in an assembly. The quantity rolls up. PART ONE would have a quantity of 3 stamped the on the PDF. The add-in takes mirrored and shared parts into consideration. It is also capable of placing a note with a folder or a file variable on the PDF. Due to the nature of the add-in, a download is not available. Contact us for a trial version.